From the clatter of the Greenwich Village 60s folk scene came a voice that was inspired, authentic, and extraordinarily deep. Fred Neil had one of those unmistakable voices, a baritone that could rumble your brain and leave cracks in your spine. Add to that the skills of one of the better blues-folk songwriters; his songs were covered by Karen Dalton, Harry Nilsson, Jefferson Airplane… anybody who knew their stuff. Released in 1967, Fred Neil is moody, soft, and dark, but shimmers in beautiful electric sound. It lives within the pinnacle of styles from which Freddy would draw his influence: Brill Building chops, cold hard blues, good old folk song, and raga spiritualism. The ten original compositions heard here are masterpiece quality pens. “Everybody’s Talkin'” would put the voice of Nilsson forever in popular knowledge thanks to Midnight Cowboy; Fred refused to sing for the movie and his unornamented version is a refreshing listen. Neil harbored a genuine love for dolphins, championing their causes throughout his life, and recording his dreamy ode to open the record. I harbor a specific love for the bluesy standard, “That’s The Bag I’m In” and songs like “Faretheewell (Fred’s Tune)” are too precious for my description. check out HP Lovecraft`s great version of “that`s the bag i`m in” off the first LP! One of my all time fav. records. 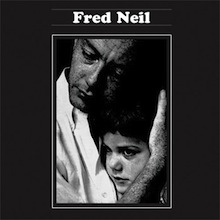 Fred Neil’s albums in Capitol (this s/t + other two that were released after) are really different from the Fred Neil who released albums in Elektra. Moody and melancholy, introspective and gentle, those three albums are, imho a must have. they were gathered in a double CD compilation (with bonuses etc) called Other Side Of This Life – a true must have for the genre lovers. Btw, speaking of covers to Neil – the world is full with these, take Tim Buckley’s live version of Dolphis (in his 1968 London live album), and The Growing Concern with The Other Side Of This Life. One of the best uses of the music in the Sopranos was The Dolphins scene. great write-up about one of my all time favorite singer/songwriters–more folks should know the majesty of fred neil. New to me. Thank you. I really appreciate how this blog highlights worthwhile music from the past as well as the now. his version of “The water is Wide” is one of my most played. His voice gets me every time. Actually, I don’t think that Fred Neil was reluctant to sing for the movie. He was actually never asked. Nilsson’s version was released first as he had heard a demo by Fred Neil. “Midnight Cowboy” director John Schlesinger picked the song and wanted to include it on the soundtrack. The producers fought the idea as they preferred to get an original song written for the movie, to get publishing rights on the track, as it was an important source of revenue at the time, while they had to pay to use an existing song. Nilsson, Randy Newman and even Bob Dylan submitted new original songs but Schlesinger was adamant in using his first choice. The story about Dylan sending “Lay Lady Lay” too late for inclusion on the soundtrack was just PR stuff: it was hard to swallow in 1969 that somebody would reject a Dylan song. But Schlesinger was right: the track quickly established the perfect mood for the movie and it was an essential part of its success. Fred Neil himself didn’t mind the song being used. It brought him tons of money, allowing to move in Florida (and far from his New York drug dealers) and, according to close friends, he was ecstatic when his idol Louis Armstrong recorded “Everybody’s Talkin'”. I agree that the self-titled Capitol album is his best work but “Bleecker & McDougal” is also wonderful and has one of the best sleeves from the ’60s. from Dylan and not from Nilsson. Fred did live off the royalties, but when the song came out he was living in Woodstock.